A BRITISH COURT began re-examining the case of a terminally ill baby today whose life support is due to be withdrawn at a London hospital, after Pope Francis and US President Donald Trump intervened in the case. 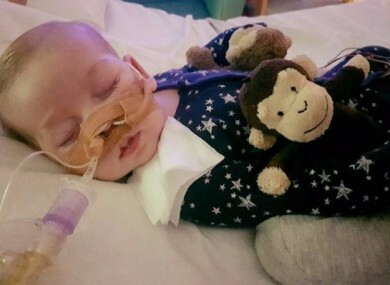 London’s Great Ormond Street Hospital said last week that it had received “claims of new evidence” that 11-month-old Charlie Gard could be treated for his disease and has asked a court to rule on how to proceed. The boy’s parents, who submitted a petition of over 350,000 signatures demanding that they be allowed to take him to the United States for treatment, attended the hearing at the High Court in London. Judge Nicholas Francis asked the parents to set out any “new evidence” they had and later adjourned the hearing until Thursday. Pope Francis last week expressed his support for the baby’s parents and said he hoped doctors would allow them to “care for their child until the end”. Bambino Gesu, a Vatican-run hospital in Rome, has since offered to treat Gard and sent medical advice suggesting that treatment could be possible. Trump also waded into the debate last week, tweeting that the United States “would be delighted” to help. A US doctor has also proposed treatment for Gard. The British hospital said on Friday that it stood by its opinion that Gard’s rare form of mitochondrial disease, which causes progressive muscle weakness in the heart and other key organs, was not treatable. Doctors there believe Gard’s brain damage is “severe and irreversible” and have said the baby may be suffering, in contradiction to the parents’ views. But doctors said it was “right to explore” any new evidence and said they were seeking the court’s view. Gard’s parents have lost a series of appeals in British courts and the European Court of Human Rights in Strasbourg and had no further legal recourse. “He’s our son, he’s our flesh and blood. We feel that it should be our right as parents to decide to give him a chance,” his mother Connie Yates said yesterday. “The whole world knows about us and about Charlie and our fight… Until you’re in this situation, you don’t understand the power of hope,” she said. Email “Parents of Charlie Gard to bring 'new evidence' to court in bid for US treatment”. Feedback on “Parents of Charlie Gard to bring 'new evidence' to court in bid for US treatment”.